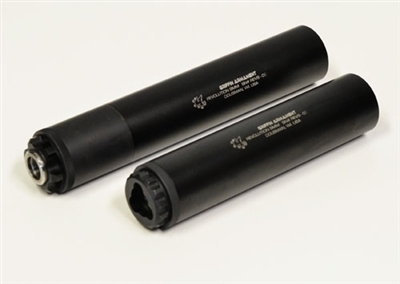 The Revolution 9mm Silencer is a full featured, configurable, and modular silencer with excellent sound performance, durability, and greater versatility than any other pistol silencer on the market today. 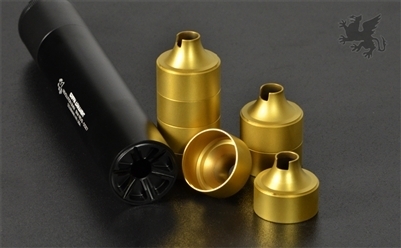 The Rev 9 silencer can be fully disassembled for end user maintenance by using the included 2" fender washer with the front cap. The Rev 9 does not require proprietary tools for dis assembly, ensuring that if lost, you can find the dis-assembly tool almost anywhere in the world. The Rev 9 is shipped in it's full size configuration with an included 1/2x28 booster piston to run on your 9mm pistol barrels. However the user can swap out the pistol booster assembly with our integral 3 lug QD assembly if desired to run on MP5's, 9mm AR carbines or anything wearing a standard 3 lug adapter. The Rev 9 can also be configured into a short (K) configuration by removing the Stainless black oxide external booster housing extension and collapsing the booster housing or 3 lug assembly into the silencer tube. This configuration is best used wet. By adding 5cc's of rem oil, wire pulling gel, or some other ablative medium sound suppression can be dampened extremely well in the short configuration.